Wave to me if you’re up there, Winston. I miss you. Ever wish you could turn back the clock? Say, you saw something you wished you hadn’t. If you could turn back the clock and if you hadn’t seen it, it never happened. Right?? That’s how I felt yesterday when TW got home from shopping and we went onto my FB feed. There it was right on top: a post from his human: "Rest in Peace my little Winston Snowydaze - 1999-2015. We will love you forever.” Just last week, Pop had been axing about him. Our hearts stopped and TW’s eyes filled with tears. With all the furrends travelling to the RB, we thought we were inured to these losses. Unfortunataely, we saw it and there was no turning back the clock. Photo by Colleen Haugen Clemons. Winston aka @Snowydaze was one of my first Twitter furrends back when Twitter was fun. We used to go for virtual car rides across country with Beaver Cat Ochoa driving. Herbie Cat and George the Duck were also with us. Just a bunch of cats enjoying life and eating tuna, without a care in the world. He had a blog a long time ago; in fact, it might have been him who gave me the idea to start this little blog. This was my favorite post from A Cat’s View of Life. Winston was a handsome pure bred Pixie-Bob cat or at least that’s what he told everybuddy since he had a tail that was three-inches short. 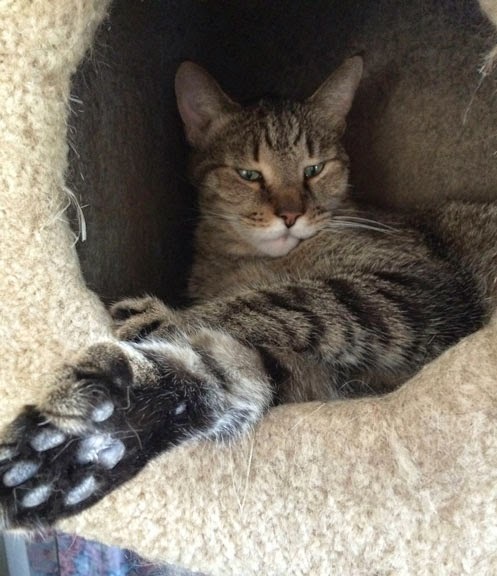 He was the first cat I knew with seven toes on each front foot and six toes on each back foot. He would have been 16 on March 13 and leaves behind his peeps and sisfur Hilter. Winston, I miss and love you. You’ll always hold a special place in my heart. You made me laugh and I’ll try to remember our adventures and laugh again. “Duck crack! !” HAH! I get the sads efurrytime one of my sweet furiends crosses that Bridge. I try to tell myself that these are the lucky kitties--the kitties who had Humans who loved them real hard and made sure they were taken care of every day for all their lives, right up till they took that leap to the Bridge. I still get sad though, I can't really help it and the Human gets the sniffles too. That's just the way it is for a time--though remembering stuff like "duck crack" (I'm trying to imagine) can sometimes cheer us up a little bit. Purrs, my darling CK and for your Woman too. I didn't know Winston well, but we were Twitter pals. I'm so sorry he is gone. Sorry for your loss, that's a beautiful rainbow in his memory. 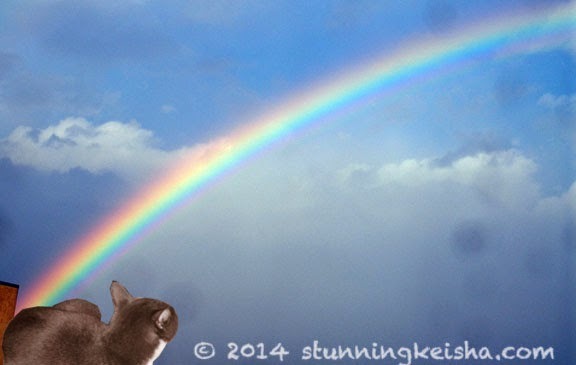 That rainbow picture brought a lump to my throat, CK. I'm so sorry that your friend is gone. We didn't know Winston but wish we had. Thatnwas so sad, I saw that on Facebook too. Oh CK, TW, and Pop, I'm sorry your buddy is gone. I went to the blog link and giggled at the skunk story- and then I saw the photograph of Hilter! (snort) They sound like a kind and funny big family. So sad. We're so sorry you lost a friend. :( Purrs. - Crepes. I've been blogging now for almost 10 years and the amount of losses I have seen just staggers the heart. Most of those I knew way back when I first started are all gone, either to the RB or quit blogging. It's hard, truly I understand and I'm sorry for the loss of your friend. I'm waving. I see youz. I want to come back. Mom keeps drowning her pillow that I shared with her. She showered me wit tears for a week before she and dad decided to let me go. I had hyperthyroidism. I wouldn't take my pills, I would try to bite and scratch mom. Mom is afraid of needles, so shots were out of the question. I wouldn't eat my prescription food. Only TUNA and my favorite dry food. Then we tried ear cream, I didn't mind that but it made my ears hot. It didn't help though I only got worse. I lost 13 pounds. I quit eating about a week ago. Stilled loved my water. I was so tired. I barely came out of the room anymore. So mom made the appointment. Yesterday morning I felt full of energy, I ran around the house, looked out every window and played at the door window wit my raccoon furrends. Confused my mom, she not know what to do. Then I tried to barf. It brought her back to reality. Lots more hugs and tears and to the sleeping doctor I went. I was so blessed to have family that loved me so much and I know the felt the same about me. I love my Twitter and Facebook furrends. I will love you forever. CK that is a beautiful, heartfelt tribute to our buddy WinstonSnowydaze. We are in shock here too, and our hearts break for his humans. We all had such good times back then. At least he didn't have to suffer CK, we are thankful for that. I see you, Winston, and I’m blowing you kisses! I am so sory for the loss of your sweet friend Winston. Oh my heart is breaking. I did not know him but I know how his mommy and family felt. The same as I did with my baby Admiral. Rest in peace precious dear little one and love to your Mom. I am very sorry you have lost a good friend CK. I read your favourite post of Winston's and it was very funny. I also read his post of today and left my condolences for his family. I never got to know Winston but it sounds like you had a lovely time in your adventures together. I loved our #roadtrips together, I will cherish the memories always. This brought tears to our eyes, we remember those wonderful trips together. It is so hard to say good-bye, I miss SirFudge as well and his precious Bentley and the day he wore a lace apron and we took a Learjet to the Bahamas and crashed in the barnyard. Paws to my heart, love you always Winston! I was thinking of the time you/we crashed the Learjet! We had so much fun. I’m glad we have those memories. Weez so sorry fur da loss. Sorry to hear about your friend CK. Sounds like he was a special cat to you and a wonderful friend. RIP Winston. CK, it is so hard to lose our beloved friends. We feel like we know so many friends so well even though we've never met them in person. We love and care about all our wonderful friends so much that it hurts so badly when they go to the Bridge. We are sending you comforting purrs and love for your hurting heart. Sorry, some major typos in that comment I had to delete. I am so sorry to hear about the loss of your friend. Rest easy sweet kitty. I have come to love - and have lost - other people's cats via the internet.. it really hurts..
We ate so sorry to learn of Winston's passing. Hugs to you, CK, and to Winston's family and all of his pals. CK so sorry to read about your friends passing. Purrs and hugs to you and to Winston's family and friends.